These house pants are for women. 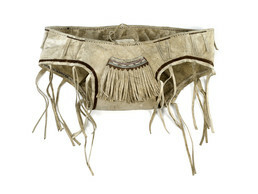 Women would dance in these pants, with beads around their necks.... A cover goes over the pants, and women would wear white and black panels that would hang down in the front and back.... Dyed reindeer hair was used for the stitching in the past, and then they switched to embroidery thread. The inner chamber of a traditional walrus-hide-covered Yupik home was heated with oil lamps, which kept it warm enough for the family to wear very minimal clothing. Men wore simple loin cloths and women wore these trunklike garments called kakak.The tasseled pants are made of tanned, scraped reindeer hide with borders of bleached and alder-dyed skin. The embroidery on the front panel is segeni, designs stitched with reindeer hair. Short pants of this kind were customary on St. Lawrence Island, in the Yupik communities of Siberia, and among the Chukchi.